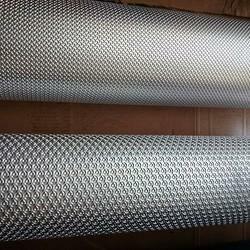 We are a leading Manufacturer of embossing roller, paper embossing roller, embossing rolls, glass embossing roll, aluminum foil embossing roller and leather embossing roller from Ahmedabad, India. Uses Paper Industry,Plastic Industry,Leangth Industry,Sheet Metal Industry, Textile Industry etc. 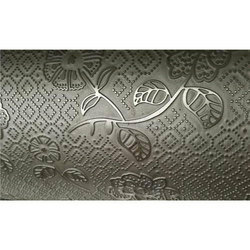 Anar are the prominent manufacturer of Embossing Roller which are highly durable and easy to use, these Embossing Rolls are used to produce medley of patterns on glass, papers, artificial leather and plastic and many more. Anar Rub Tech Pvt. 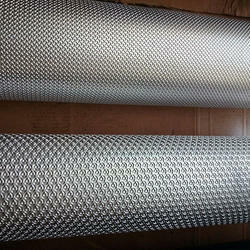 Ltd leading manufacturers and exporters of embossing rollers. These rollers find extensive use in engraving on PVC Leather Cloth, PU Leather, PVC Sheet, tissue paper, figure glass, PP, PE sheets, wallpaper and floorings. The rollers are manufactured at a state-of-the-art facility of Anar Rub Tech Pvt. Ltd, India with the sophisticated Digilaser technology. The best of materials, latest techniques, skilled manpower, supplemented by strict quality control and prompt delivery schedules all go in to create products that serve our customers' specific requirements. 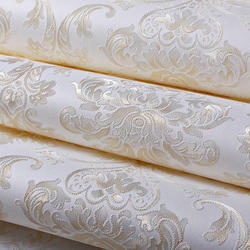 Our Embossing Rollers of unbeatable quality. 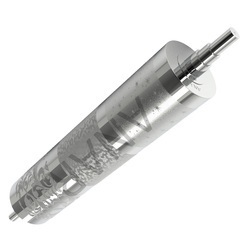 Our line of rollers finds wide application in various engraving operations on PVC, PU, PP, PE and allied products. Be it PVC Leather Cloth, PVC Sheet, PU Leather, PE Sheets or even products like Tissue Paper and Figure Glass, we ensure products meet application versatility at low cost with ease. Our Embossing Rollers are engineered utilizing hi tech Digilaser technology by skilled professionals and can be promptly shipped by our network of supply agents based across the domestic and international markets. Manufactured via specialized heating treatment, these rollers underline our special emphasis on R D. These rollers are research based products that are designed to suit surface embossing needs on leather, leatherneck, glass, paper, plastic, sheet, non-woven cloth, non-ferrous metal, and allied substrates. Banking on expertise of competent industrial designers, engineers and technicians, we explore manufacturing of a broad range of 3D Embossing Rolls that can be availed in various sizes and dimensions, even in customized forms to suit specific application needs of our clients. Widely used for executing embossing works on leather and other substances, our range enjoys extensive industry demand. 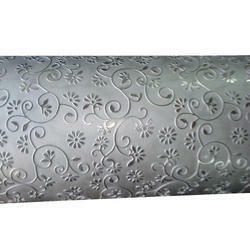 Leather Embossing Roll we supply is made using superior grade aluminum alloy by the process of extrusion rotation. This makes it easy to manage and clean and enhances the ink flowing circulation with improved printing quality. Our range is available in standards sizes and can also be made to order as per specifications provided by clients. 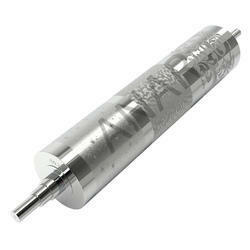 Offering our best quality Aluminum Embossing Roller. These rollers can also be customized as per the needs and industrial usage of the clients. Leather Embossing Roll: Be made of aluminum alloy by extrusion rotation with whole bidirectional body eight corrugations, quality assurance, beautiful appearance, easy to clean, easily eliminating air bubbles, increasing ink flowing circulation, isolated impurities in ink tank completely prevented ink dried, to improve printing quality. This ink stick haves good stirring performance, floating on the surface of ink. When roller rolling, the ink stick rotates opposite direction by the adsorption of rotation. The surface ink will turn around bringing along with the ripple. So it makes ink mixed equably to avoid the quality problem. The roller can also be made exactly as per the customers' drawing and in the material required by the customer. we are completely adept in offering a wide gamut of Paper Embossing Roll to our esteemed clients within specified time-frame. The offered range is used in paper industry to emboss designs and patterns to create 3D effect. While designing and fabricating this paper emboss roll, we employ optimum quality basic material in adherence to set industrial norms. Our product is highly demanded for its superior quality, longer functional life as well as perfect functionality. Post production, the entire range of paper embossing roll is tested on several quality parameters to ensure clients get immaculate range. 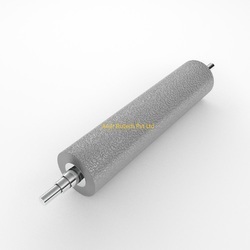 We are in the manufacturing of leather embossing rollers.The durable embossing tools are ideally suited for the industrial refinement of large quantities. They are produced and customized according to our clients’ technical requirements. Our services range from roller refurbishment to the delivery of completely new leather embossing rollers. Backed by a proficient and highly devoted team of professionals, we are highly engaged in offering our clients an extensive array of 3D Embossing Roll. Manufactured and offered by us in various sizes and dimensions, we are offering customization facility for these products on order to suit the varied needs of our clients. Known for their uses in various industries for embossing on leather and other substance, these rollers are high in demand.